More than 4 million TV viewers have seen how an innovative Coventry company’s product can help the healing process after surgery. Fans of the popular BBC One programme Holby City have been keeping a close eye on Dr Harry Trussler’s recovery from a nasty fall which saw him sustain facial injuries. 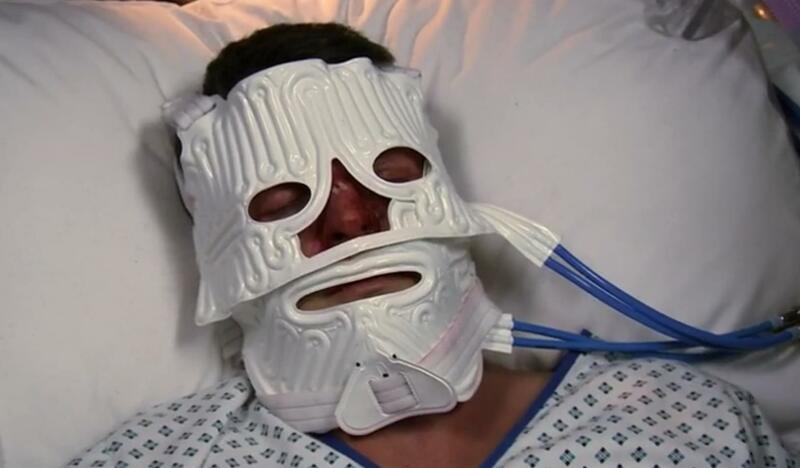 After undergoing surgery to his face, cooling masks – provided by Hilotherapy UK based at the University of Warwick Science Park’s Venture Centre – were placed on him to help keep the temperature in his face low, which is proven to reduce swelling and pain therefore reducing the need for painkilling drugs and cutting down the recovery time. Tony Ley, the Managing Director for the firm, which moved into the Science Park in 2013, visited the Holby City studios at the end of last year to advise on the use of the Hilotherm treatment and episodes featuring the product have recently been aired. Katharine Stein, of Hilotherapy, said: “Holby City often asks specialist consultants for recommendations of new innovative treatments that can be featured on the show to ensure it reflects what is really happening in hospitals. Tony went down to the studio and showed them the product and gave them a full demonstration of the way it should be used and when. Hilotherapy is the UK distributor for a German company, which developed the technology to lower the temperature of damaged tissue by sending cool water from a standalone device to a ‘cuff’ which is placed on the affected area of the body. University Hospital Coventry and Warwickshire was among the first NHS hospitals to buy the technology along with Chelsea & Westminster, King’s College Hospital, University College London Hospital, Nottingham, Sheffield, York, Leeds and Bradford. Further hospitals have since invested in the technology along with private clinics and sports clubs. Karen Aston, Venture Centre manager at the University of Warwick Science Park, said: “Hilotherapy came to the Science Park because they wanted to grow here by using the flexible space and saw the ties with the University as a major plus.